New Era designs and fabricates a wide variety of air floatation style dryers. Our experienced engineering department allows us to provide a seamless solution for your coating and drying needs, whether purchasing a New Era provided drying system or integrating a 3rd party dryer. Please contact us to learn more about this proprietary design, which allows for roller support of the web with out the need for a dryer arch. New Era provides specialty configurations for such purposes as curing, annealing, stretching, foaming, or controlled atmosphere web exposure. Whatever your needs, our experts can find the optimal drying method to achieve your desired end product. New Era designs and builds a variety of custom enclosures for web treatment. 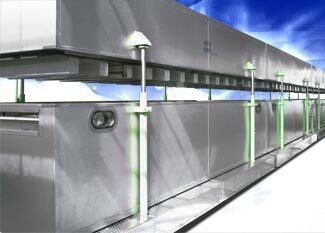 These enclosures, which can be used to expose webs to varying environments, can by provided with a broad range of features including temperature and humidity control, adjustable dwell time (varying web length) and multiple web tension and speed zones. New Era provides a variety of custom pre-packaged apparatus units. Each assembly typically incorporates pre-mounted, piped and wired heat sources, circulation fans, exhaust fans and filtering hardware. Every apparatus unit is designed for ease of maintenance and access.